The New Scorpion Band was formed in 1993. The name is taken from the original Scorpion Band, a quartet who performed with clarinet, trombone, cornopean and bass drum in the Dorchester area during the years around 1830. The New Scorpion Band was created by the distinguished Dorset folk singer Tim Laycock, who has devoted a lifetime to the music and traditions of the South West of England. The members of the band bring together a wide experience of many different styles of music - the English, Scots and Irish traditions, early, baroque and classical music, opera, jazz, brass bands and theatre, television and film music. In 2001, the band’s violinist Colin Thompson decided to leave, no longer wanting the constant travelling of the gigging musician's life. He was replaced by Sharon Lindo, who has brought to the band a surprising range of instrumental skills (she also plays guitar, mandolin and trombone) and has greatly extended its harmony vocals with her strong soprano voice. The band has played at a long list of music, arts, historical and folk festivals, Arts Centres and other concert venues in the UK and elsewhere in Europe. They have made three British Council-sponsored tours of Colombia, playing at venues from the main concert hall in Bogota to audiences of young people in disadvantaged parts of the city, and villagers living in the heart of the civil war. 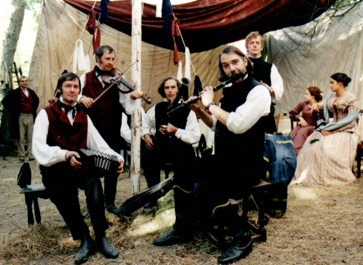 The group appeared as the village band in Alan Ayckbourn’s “House and Garden” at the National Theatre, London, and featured in ITV’s film of Thomas Hardy’s “The Mayor of Casterbridge”. The New Scorpion Band is well known for its themed programmes of words and music, on subjects including Christmas (The Holly and the Ivy), Halloween and the supernatural (Cold Blows the Wind), the life of Lord Nelson (Bold Nelson’s Praise) and more (see our Words & Music page for further details). The group's skills with words and music have led to various commissions – in 2010 they were invited to create That Noble Fellow Collingwood by The Sage, Gateshead for the bicentenary of the famous admiral’s death, and in 2007 they received a commission from Lancaster Cathedral for Sound The Jubilee, marking the Abolition of the Slave Trade in 1807, which has been performed at Sidmouth and other festivals, and features the actor Tas Emiabata. In 2006, the members of the New Scorpion Band modelled the playing of various instruments for the sculptor Paul Fletcher, who was creating a new set of musical angels for Bath Abbey. The angels, carved in limewood by Laurence Beckford, can be seen above the Abbey’s choir stalls, playing the violin, concertina, Irish pipes, tuba, theorbo and flute. At the end of 2012, Tim decided to leave the band, in order to concentrate on his solo career and other musical projects. Working with Tim has been a great pleasure and privilege for all of us, and we wish him all good fortune and every success in his future career. Meanwhile, the New Scorpion Band continues with four members, and from the beginning of 2013 another adventurous chapter in the band’s history has begun!